Greatest decline in orders of manufactured goods since January signals continued economic weakness. NEW YORK (CNNMoney.com) -- Orders for durable goods posted the biggest decline in seven months in August, according to Thursday's report from the Department of Commerce that raises economic caution flags for the second half of 2008. Orders fell 4.5%, more than the 1.3% drop expected by a survey of economists by Briefing.com. In January, durable orders were down 4.7%. 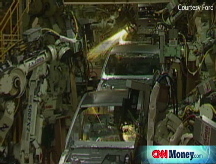 "We are seeing weaker activity in manufacturing," said Sam Bullard, economist at Wachovia Bank. "There's not a lot of positives in this report." The data for August followed three consecutive monthly increases, including a downwardly revised 0.8% July rise. The weak report was driven by softness in new orders for commercial aircraft and motor vehicles, according to Bullard. Excluding defense goods, new orders decreased 5%, and they fell 3% excluding transportation products, showing a manufacturing sector battered by the slowdown facing the overall economy. The report is a precursor to weak business capital spending in the second half of the year, resulting in a bleaker economic forecast, Bullard said. Durable orders - goods built to last 3 years or more - measures the dollar volume of orders, shipments and unfilled orders of durable goods. The report is considered an indicator of manufacturing activity.